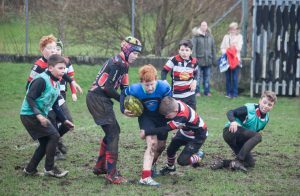 Once again, there was a great buzz about Mains Park on Sunday for the Minis home fixture against Stirling County, Preston Lodge and Musselburgh. The Wee Reds Café was in full swing and a big thanks to all who contributed and helped out. There was a super choice of home-made soup and stovies, home baking, bacon and flat sausage rolls, along with sweets, juice and coffee – fabulous effort all round! On the field, the fare was just as good, with some cracking matches played across the age groups from P4 to P7. Today we welcomed two teams from Stirling County, one from Preston Lodge and a large squad from Musselburgh with whom we combined forces to create a Barbarians team. 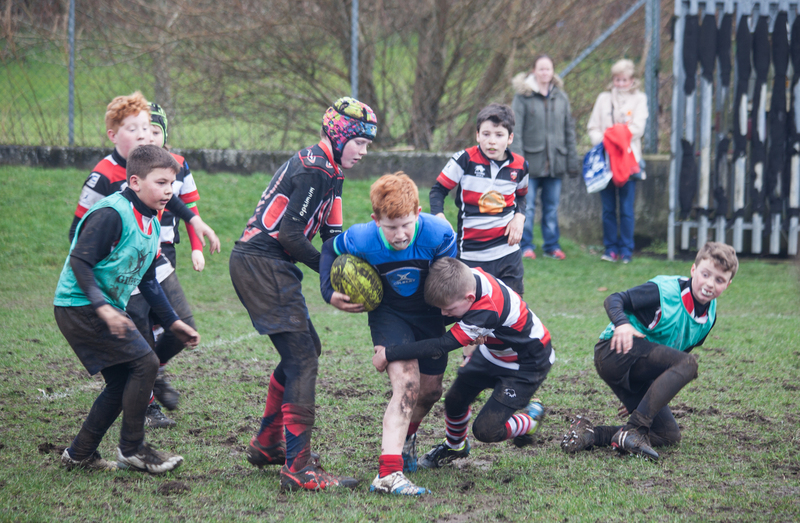 It was muddy underfoot but the ground held up remarkably well and allowed some free-flowing rugby. The first two games were against the the two Stirling sides, both of which were evenly matched, closely winning one and closely losing the other. There was strong running and good tackling by both sides and they both scored tries when a bit of space opened up. In the contact area we need to be a bit quicker at attacking the ball when it is on the ground and supporting our teammates in the ruck. We played the third game against a feisty Musselburgh side. Again, it was a closely fought match that ended up in a draw. We started to see the space a bit more with great running and offloads from the team. Unfortunately one of the Musselburgh lads suffered a quite serious head knock when making a tackle and was taken off with concussion. This highlights the importance of getting the head in the right place when making a tackle, something which we are working on each week in training. Our last game was against the Barbarians and both sides were fielding four new players. It was an entertaining game with some great running and support play from both teams. Fixtures like today’s are great for putting into practice what we are working on in training and are especially useful for players new to the game to get experience of the match situation. Particular mention should be made of Ailsa, Ross, Alex and Jamie who acquitted themselves very well and will be a brilliant addition to our squad. Just a short note on our matches on Sunday. We got some nice conditions and a relatively fast pitch to play on against Stirling County and Musselburgh on Sunday. Both of these teams looked slightly bulkier than our own squad – I think we’re going to have to look into the West Lothian diets !! The boys played Musselburgh first, and due to some sloppy tackling and slow reactions at the breakdown, we were 2 tries down at the break. As seems to be our style, the boys got really fired up by being behind and came out in the second half a different team. Some great physical play in the forwards and some direct running from our backs saw us tied at the full time whistle, while still pressing on the Musselburgh line. We played Stirling next, and lost the quickest try of the season so far by failing to tackle Stirling’s first ball carrier who made a strong run and crashed over the line. We lost another try as we got transfixed on the breakdown, leaving masses of space on the wing which Stirling passed into to score unchallenged. Once more, we woke up at this point and scored some nice tries of our own, with a some nice support running punching a hole in the County wing defence. The match finished with the Reds one try behind, but again were in the ascendancy when the final whistle blew. We have lots to work on at training this week, with the breakdown being key as we were turned over almost half of the time we took the ball into contact which makes it impossible to play any style of rugby. Well done to the boys for sticking to the task right up to the final whistle, but we need to concentrate on not being 2 tries down before we start playing our own game.